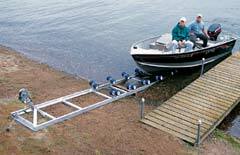 Heavy-duty Roll-n-Go model handles boats up to 2000 lbs. It’s the perfect replacement for cumbersome, in-water lifts. Typically used for 16′ to 18′ fishing boats, jet boats, etc. 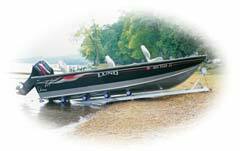 Tilting axles, each with two extra-wide urethane rocking rollers, gently cradle any boat hull. Optional 8′ 11″ extension available. The standard 1700-lb. winch with 25′ strap is upgradeable to a 1500 or 2500-lb. self-braking winch with 25′ or 50′ cables. Easy-to-assemble kit includes ground anchor system.